We’re always looking for new ways to make it easier for you to share your photos and videos with the people who matter to you. Today, we’re launching a new and improved way to share your Flickr photos with your friends and family on Facebook! Just connect your Flickr and Facebook accounts and we’ll automatically send an update to your Facebook feed every time you upload a public photo or video. As always, you have control over who sees your Flickr images. Once you enable Facebook sharing, updates are only automatically sent to your Facebook feed when you upload them as public (or when you set a photo to public). We’re using the Yahoo! Updates platform to power this integration. Yahoo! 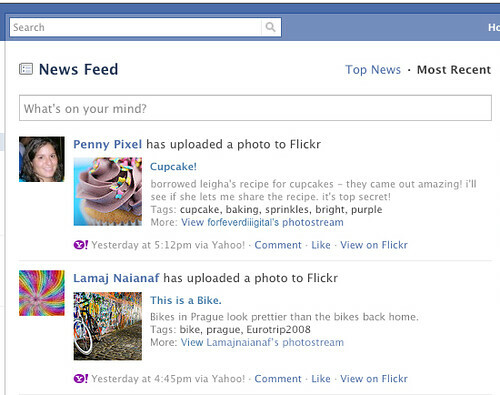 Updates lets you share and view activity across multiple social networks, including on Yahoo!. Your Flickr updates are only visible to you on Yahoo! Updates by default. To manage your settings, first, make sure you’re logged into Yahoo! and then go to this link. For more info on how you can connect to Facebook and Yahoo! Updates check out these FAQs. If you have feedback or encounter bugs, please head over to the Help Forum and let us know. UPDATE June 10 4:46pm PDT Removing the old integration is not needed and may delete posts from your feed. World Cup memories from the Commons!